Many of India’s cities have become bustling centers for high technology and heavy industry, but hundreds of millions of people in the countryside remain off the grid. Growing up in rural Bihar State, Manoj Sinha knew what it was like to sit in the dark. So after earning an electrical engineering degree at the University of Massachusetts, Amherst, and working for the Intel Corporation, he began exploring ways to turn farm waste into electricity, with the dream of building village-scale generators. 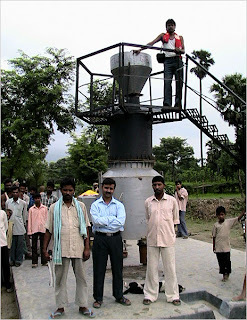 Husk Power Systems’ first power plant in Bihar, India, as it was being assembled. Its fuel is rice husks. Last year at the University of Virginia, where he is studying for a master’s at the Darden School of Business, he and a fellow student, Charles Ransler, teamed up with another engineer from Bihar, Gyanesh Pandey, and Husk Power Systems was born. The Indian engineers, both 31, had initially planned on raising money to build small generators for simply a few villages. But the company now has a proprietary generator that runs on a methane-like gas released by heating rice husks a certain way. A waste product of rice milling, husks are plentiful in villages. While agricultural waste is common for generating heat, it is not often used for generating electricity, and there is nothing remotely like this system in the villages of developing countries. The system produces enough electricity to supply 300 to 500 households for 8 to 10 hours a day. A byproduct is silica, a valuable ingredient in making cement. The long-term plan is to profit from the global market in credits — earned by avoiding greenhouse-gas emissions, which result from burning fossil fuels like coal — and to sell the benefit. Husk Power Systems won first place in 2008 in the University of Virginia business plan competition and the social innovation competition at the University of Texas, Austin. The students are headquartered at the Darden School of Business incubator, where they get space and advice. There are generators in five villages now, with the hope of expanding to 100 within a few years, Mr. Ransler says. Eventually, these communities could shift to other electricity sources as the Indian economy matures. But Mr. Ransler, 30, predicts there will be a market for many years to come for small-scale power systems burning renewable farm waste.